The last couple of weeks in the Bay Area have been difficult to say the least. We have lost so many community members to needless violence. Some at the hands of the state and some at the hands of predators. His name was Dujuan Armstrong. He was 23 years old. On June 22nd, he entered the Santa Rita Jail for his weekend sentence. He never came home. The jail has refused to give the family any answers, even as to where his clothes have gone. The family reports that when they finally saw the body, he was covered in bruises. Three people have died in Santa Rita this year, one just three days after Dujuan. #sayhisname. Support Dujuan’s family by donating here. The families of Dujuan and Jessica held a rally and vigil at Santa Rita Jail on August 3rd to demand answers and demand justice. Read More. Jessica's family held a candle-less vigil and walk in the dark from Santa Rita to Dublin BART -- the same walk Jessica made shortly before her death -- on August 19th to demand an end to late night releases. Read More. Imagine it’s 2 am, and after a night of drinking you stumble and cut your elbow on a piece of glass. Even in your drunken stupor, you realize that this “son of a cut” needs stitches, so off to the ER you go. Before ever seeing a nurse or doctor, the first face to greet you is that of a police officer. Imagine being stitched up and before you can head home, this officer inquires about what happened, how you got there, and so on. Those of us born in Black bodies are familiar with the flutter, the racing thoughts and the flashbacks that occur when a police officer asks to speak with you. We are acutely aware that our Blackness has already made us guilty of being a potential menace. Yet under all this pressure, it is in our best interest not to appear nervous or guilty if we want to survive. After all, we just came to the hospital for some stitches, right? Police are everywhere. You can find them in their various forms in our elementary schools and universities, our hospitals, and our transit systems. They are at our borders, in our airports, watching us wherever we move. Where official police forces do not reside, we see the type of security forces whose sole agenda is to protect property, not people. As a nurse, I have seen law enforcement and prison guards leave intubated patients handcuffed to hospital beds. Many, if not most, of us have heard about incarcerated women giving birth in chains. When did we, as healthcare providers, give up? When did we surrender one of our most essential systems to the prison-industrial complex and the henchmen who fuel that beast? The need to feel safe is understandable. Creating an environment that is safe for some but not all is unacceptable. There is an historic mistrust of the healthcare system by POC, queer, poor, addicted folks and folks with mental health needs. This distrust is further fueled by having uniformed and armed police at our front doors. What happens when someone finds themselves assaulted, shot, stabbed, suicidal, or when a victim of domestic violence finds themselves in need of medical attention? What happens when their fear of law enforcement is more overwhelming than their injuries? Will the domestic violence victim be pressured into giving information that will result in more physical abuse later? Will an easily treated wound become infected, and cause further harm? Will the suicidal patient commit suicide because death seems more bearable than jail? We have to ask ourselves: What are we afraid of? Why are we so afraid that we’re willing to compromise our practice, our oaths, and our integrity for a system that has historically and systematically oppressed, murdered and harmed the very people we have sworn to care for? The Florence Nightingale pledge ends by stating “I will devote myself to the welfare of those committed to my care,” There are many parts of that pledge that are problematic and outdated but this is its true heart. If we – as nurses, doctors and healthcare workers – are truly committed to the welfare of our patients, then creating an environment where ALL of our patients feel safe to come for treatment should be our priority. We must diligently guard our hospitals and clinics against becoming part of America's growing police state. We do not have to grant police access to our patients or their health information. We can inform our patients of their rights and challenge policies, culture and practice in our respective hospitals and clinics. We can organize and demand not to work in an environment where guns are being openly carried by anyone. We can demand that medical attention should be given when necessary and not when police deem a situation “safe”. No matter what our political associations, religious beliefs, or life experiences, we can agree that our patients should not be afraid to seek help when in need of medical attention. The horrors at the U.S.-Mexico border that have been brought to light over the last few months is state violence in a most egregious form. Thousands of children stolen from parents fleeing horrific conditions in their home countries – conditions that have been caused by decades of U.S. imperialism and war. These are people that risk life and limb in the hope of capturing a sliver of the American “dream”. What greets them instead is an American nightmare. Children ripped from their mothers breast while nursing. Parents promised calls to their children, but then denied. Children lost by U.S. officials. Policies that deny children comfort when they cry. Public outrage pressured Donald Trump to sign an Executive Order to end family separations, but hundreds of young people “deemed ineligible” for reunification remain warehoused in cages with up to 20 children in one cell, too young to comprehend what is happening, where their parents are, or what is coming next. How is it possible that a child can be deemed “ineligible” to be with their parents? What’s more, ending family separations just means holding families in prisons together. That is not an acceptable answer either. Incarceration is not immigration reform. APTP is committed to rapidly responding to, interrupting, and eradicating state violence in communities of color. All state violence. Whether that is local law enforcement, state law enforcement, or ICE. The most important thing we can do in this moment is to continue to fight back. Resistance is a moral imperative when children are languishing in cages. We have no choice but to stand in solidarity with immigrants of all races, creeds and colors and demand an end to the vile practices of this administration now. To demand the immediate abolishment of ICE now. To demand the reunification of families now. To demand the release of all those incarcerated at our country’s so-called borders now. As a Black woman who has the DNA of chattel slavery coursing through her veins, I shudder at the remembrance of my ancestors having their children ripped from their bodies and sold for profit. It was inhumane then and it is inhumane now. In 2018 we should know better and we most certainly should be doing better. ICE was created in 2003, only 15 years ago, as a xenophobic response to 9/11. There is no reason it can’t be abolished. We need to seek and implement humane systems for accepting and supporting people seeking asylum at our borders. Donate to an organization doing the work. Head to the border and stand in solidarity. Talk to every neighbor on your block. Use social media platforms to amplify your voice. Get busy. Stand for the people. Do it right now. Lives are on the line. Justice is on the line. Humanity is on the line. State violence does not only occur when law enforcement kills us. It’s insidiousness plays out in so many different ways, including while people are incarcerated. Santa Rita jail, located in Dublin, California, has a long legacy of human rights abuses against incarcerated people. Everything from rat-infested food supplies to cells covered in urine, blood and feces to long stints of solitary confinement where people are mocked and laughed at. In severe cases, like recently that of 23-year-old Dujuan Armstrong, these horrific conditions can lead to death. For those who do make it out, they are released with no transportation, no way to communicate with loved ones, hungry, emotionally drained, and walking with the trauma of incarceration. We believe that without healing - there can be no justice. So, in May 2018, APTP launched its 21st Century Survival Program Series with our first Santa Rita Support Healing Justice event. A team of our members went out to Santa Rita and provided people being released – and families and friends of people still inside – with supplies, resources and information. We brought sandwiches, clean underwear and socks, BART cards, healing kits with bath salts and teas, belts and shoelaces, and smoothies and water to hand out to folks. We also provided a list of resources and community organizations that people could connect with for more support, either for their incarcerated loved one or upon their own release. In solidarity with people in jail and in the spirit of abolishing prisons, APTP plans to continue our Santa Rita support efforts monthly. If you are a healer, speak a language besides English, can donate for supplies, or would otherwise like to support this program, please contact daniela.kantorova@gmail.com. Stay tuned as APTP rolls out additional 21st Century Survival Programs to strengthen, uplift and meet the material needs of our community in other ways. We take care of us. AB 931, the Police Accountability and Community Protection Act, can reduce the number of police killings by allowing the use of deadly force ONLY when there is an imminent threat to an officer or someone else, and there are no other viable alternatives. SB 1421, the Right to Know Bill, will open up police records related to serious use of force and misconduct. The public deserves to know when a member of the public is beaten, sexually assaulted or killed by a police officer. 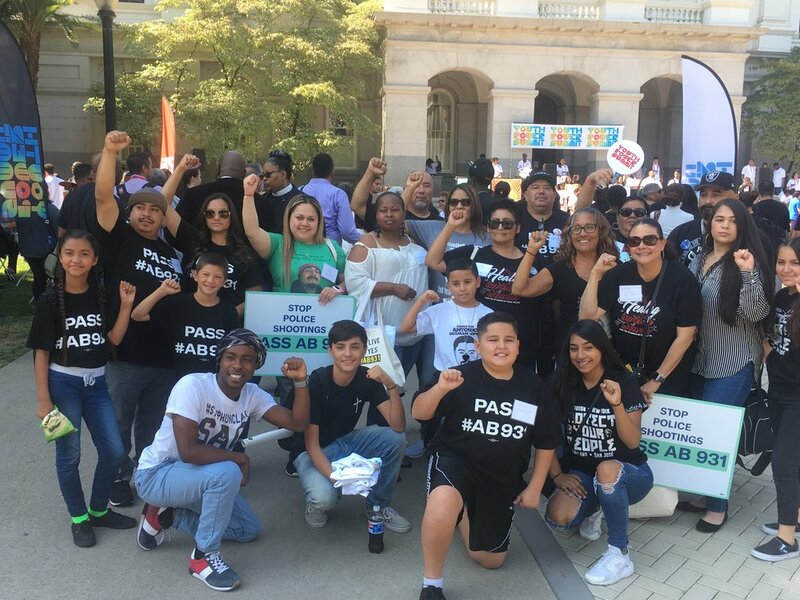 Led by impacted families, our coalition has mobilized to Sacramento several times this summer to push these bills forward -- most recently on August 13 when we brought a strong APTP presence to the capitol to lobby for AB 931. Stay posted for a full update in the next couple of weeks. In the last two decades, the Oakland Police Department’s budget has grown 123%, a surge of $277 million. In comparison, the City of Oakland’s budget has only grown by 51% in the same time period. In short, OPD’s budget is growing faster than the city’s entire General Fund. This isn’t just unsustainable, it represents a divestment from our communities at a time when they must be strengthened and empowered in the face of violent white supremacy. Defund OPD is a subcommittee of APTP committed to reducing the police department’s budget and redirecting that money to meet the needs of our community: housing, jobs, youth program, healthy neighborhoods - all the things that really produce community safety. We are currently collaborating with various Oakland organizations, leading presentations about the status of Oakland’s budget and how that money is spent. Please reach out to defundOPD@gmail.com if you or your organization are interested in a presentation. APTP’s First Responders Committee is looking for licensed therapists who can provide free, long-term services to families affected by police terror. Ideally we would like them to be able to do home visits. Those interested can contact Daniela Kantorova directly at daniela.kantorova@gmail.com, or sign up here. 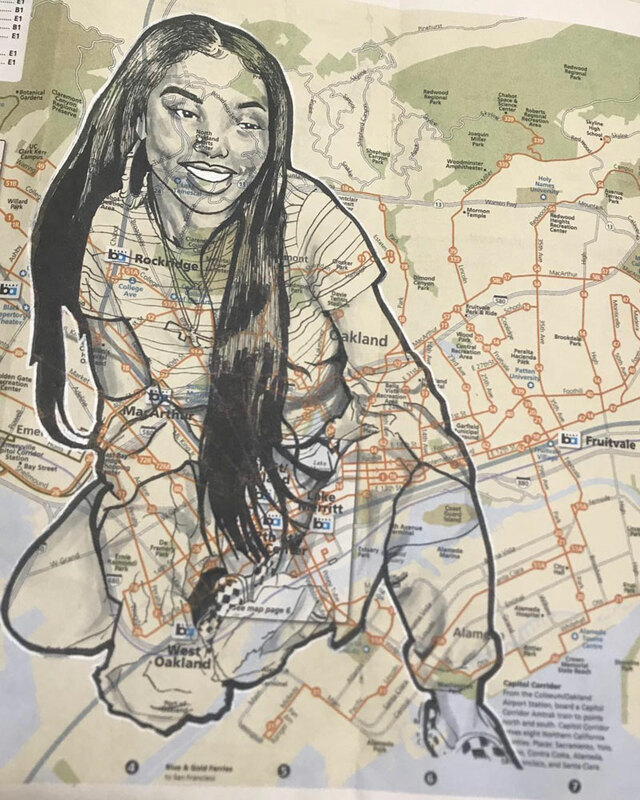 In late June, members of APTP (Co-founder Asantewaa Jordan, Director of Policy James Burch and Director of Fundraising Annie Banks) traveled to so-called Canada, to the colonially-known city of Vancouver, which is actually the unceded and occupied territories of the xʷməθkʷəy̓əm, səl̓ilwətaɁɬ, and Sḵwx̱wú7mesh peoples. The trio participated in a panel called "Healing & Resistance in a Police State" with Indigenous freedom fighter Kanahus Manuel and members of the Vancouver Area Network of Drug Users Hugh Lampkin and Kevin Yake, organized by community members Ruby Smith-Diaz and Kaleb Morrison. APTP members then co-facilitated two workshops in two days with community groups in Surrey and Vancouver, two cities facing brutal and oppressive police terror, gentrification, racism and profiling. In collaboration with groups like Alliance Against Displacement, VANDU, and multiple groups based in both Surrey and Vancouver, APTP spent the weekend talking about our collective work and strategizing with the Canadian collectives. It was a powerful, cross-border coming together in resistance to state terror! Photo credit: Kaleb Morrison. Pictured: Kevin Yake, Hugh Lampkin, Kanahus Manuel, Annie Banks, James Burch and Asantewaa Jordan. APTP co-founder, Asantewaa Jordan, and Daniela Kantorova, APTP first responders committee co-chair, presented at the convention of the American Psychological Association (APA) in San Francisco on August 9, 2018. Their presentation was titled "Accompaniment in Times of Terror: Supporting Families Impacted by Police Killings.” The presentation proposal was accepted by APA division 48 (Peace Psychology). APTP is working on formal research projects to gain a deeper knowledge of the ways in which state violence and police terror impact families, in order to learn how to best provide family and community support. Justice for Terry Amons, Jr -- Rally and March, September 15, 2018, 2-4 pm, Pittsburg Police Dept, 65 Civic Ave, Pittsburg, CA 94565. Terry Amons, Jr. was shot and killed by Pittsburg, CA police on January 12, 2018, while eating dinner inside his car outside of Nations Burgers in Pittsburg. Please join Terry's family to rally together and unite as a collective force to demand justice for Terry. For those coming from the Oakland area, we will try to help with rides and carpooling. See facebook event for more details. Rapid response training with APTP and Alameda County Immigration Legal and Education Partnership (ACILEP), September 22, 10am - 3pm, Oakland Main library, 125 14 Street, Oakland, CA 94612. Summer Fund Drive: Help Us Reach 100 Donors in 100 Days! APTP is an all-volunteer, grassroots organization. Earlier this month, we launched a summer fund drive to ask our community to help fund our critical work. Our goal is to reach 100 new donors in 100 days! Thank you to all who have generously given so far. Right now, we need more folks to help us reach our goal: give to APTP today to become one of our 100 donors! And if you're feeling extra generous, become a monthly donor or upgrade your monthly donation today! At the end of our drive, sometime in late October, we’ll celebrate with a happy hour for all who would like to join us — more details to come! Donate online via PayPal – to become a monthly donor, make sure to check the "Make this a monthly donation" box before submitting your gift! Send us a check – please make checks out to Anti Police-Terror Project and send to 1201 MLK, Suite 200, Oakland, CA 94612. Give in cash – email annie.aptp@gmail.com or catch us at our monthly meetings every third Wednesday of the month! Spread the word – once you've finished donating, or even if you can't give today, forward this email to 5 people who support APTP too! Thank you & much love!